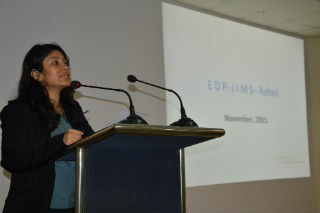 An EDP was organised on 7.11.15 (Saturday)at JIMS sector-5, Rohini for the first year PGDM students. The EDP was conducted by Mr H. P. Singh, Chief Consultant for skill development at National Institute for Entrepreneurship & Small business Development (NIESBUD). 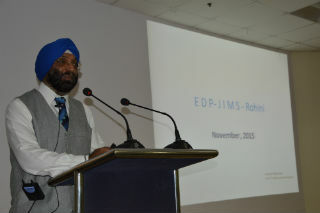 Mr.Singh discussed the government trade policies, explained about the Micro, Small and medium manufacturing enterprises. The significance of the financial institutions like SIDBI, EXIM bank and NABARD was also described to the audience. 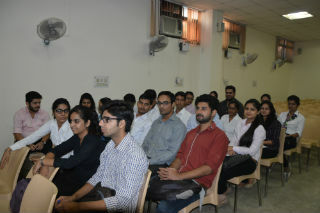 The finance schemes offered by different banks were told to the students. 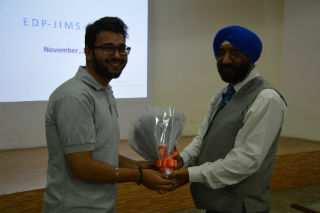 Mr. Singh shared many examples of people who became successful inlife with their innovative ideas. The inspiring stories of Bittoo Tikki Wala, Ajjay Aggarwal (Maxx mobile), Richa Kaur (zivame), Bharti Taneja (Alpscosmetic) motivated the students to take up entrepreneurship as an alternative career path.